Pricing: How to estimate the cost of your cane or rush repair job. *Please note that the prices set out below are calculated using a formula that reflects an hourly labour rate of around £12 per hour + materials at cost. Please note that this equates to a labour rate of about £12 per hour. Add £20.00 to the above prices if fine reel rush (3mm dia) is required. The chair illustrated to above has a front rail that is 44 cm wide so falls into the large category and was repaired using 5mm 'Reel Rush'. On rare occasions a piece of furniture such as this 17th Century Jardiniere to the right comes to me for repair. 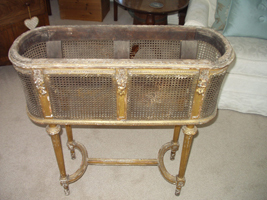 The cane work on this (circa) three hundred year old piece is 'blind' caned. This means that the holes for the cane do not go right through the wooden frame, but are drilled to a depth of about one centimetre. As a result each strand of cane has to be glued in place individually. This is a very time consuming process. As a result the cost to undertake such work attracts a higher rate than regular cane work. To estimate the cost of repair, count the number of holes in each panel as per the example above, but multiply the result by 35 pence insead of 25 pence. Add up the cost of each panel (six in this case) to arrive at the total cost for the job. 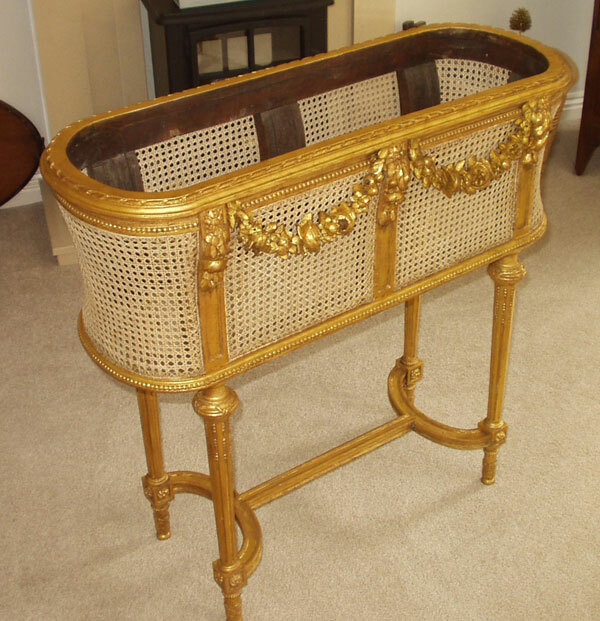 This is how this beautiful piece looked following restoration. The first job was to rmove all the old cane and repair the wooden frame. 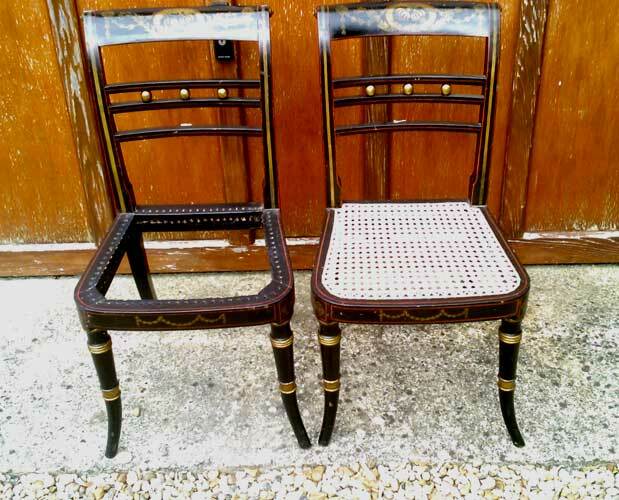 This was undertaken by furniture restorer Gavin Green. The next job was to replace all the cane - a task that took about three months - including a lot of down time between working sessions. 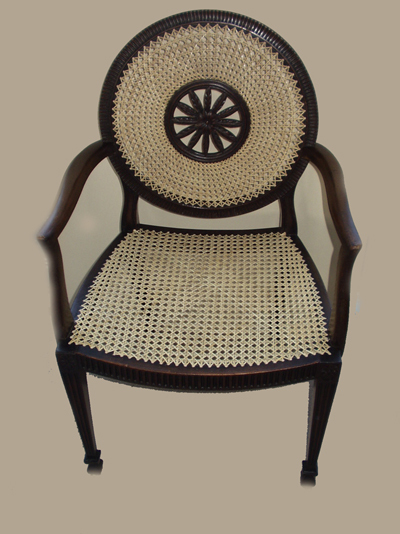 When the cane work was complete the piece went to Jane Hall who is a talented furniture conservator. One of the swags was also missing so an exact copy was carved in wood by another artisan tradesman that Jane knows. Jane then completed the work by guilding the entire piece and then slightly distressing it. The total cost to restore this piece was in the order of £4K. 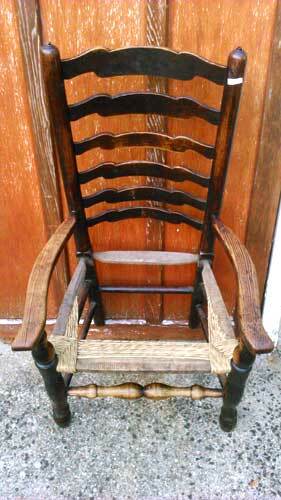 Weaving a medallion back chair takes a lot longer than a standard six way weave chair seat and consequently attracts a higher charge. Count the number of radial double strands. There are 76 in the chair back illustrated on the right. Count the number of concentric double strands. There are seven in the chair back illustrared on the right. Multiply these two figures together (76 x 7 = 532) and then multiply 532 by 32 pence. This gives a cost of £170.24 for the chair back. The cost to re-cane the seat of this chair was calculated using my standard 6 way weave formula (32 holes x 25 holes = 800 x 0.25 = £200.00).